It’s time for another issue of the AdDuplex report on Windows Phone devices. We decided to take a look at the data from a slightly different angle in each report and this time we will slice the data geographically a bit more than we did before. 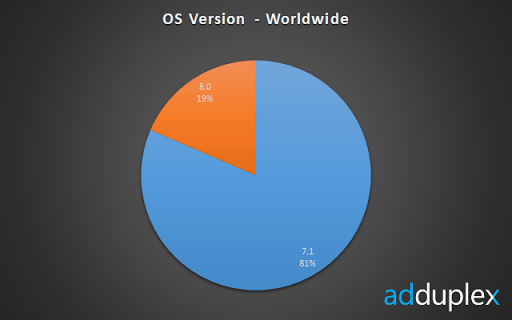 This report is based on data collected by 215 Windows Phone apps running AdDuplex SDK v.2. The raw data analyzed was collected over the day of January 3rd, 2013 (UTC time). We’ve made every attempt to consolidate different reported phone model names under their canonical retail model names, but it’s possible that some of the rare model name variations were not accounted for. Special note to Ed Bott: no professional statistician was involved in producing this report. We have this data and try to produce as accurate report as we can. You shouldn’t make any investment or other serious decisions based on this report. The most notable change is that high end Windows Phone 8 models gained a lot of ground over a little more than a month since our last report. Nokia Lumia 920 share more than doubled and left its predecessor behind. HTC 8X has raised from sub 1% to a healthy 3% mark. 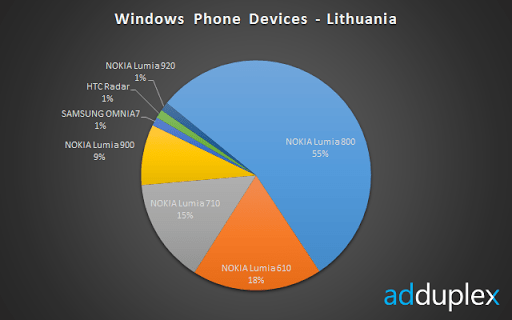 Most of this growth happened at the expense of the older models, but it’s interesting to note that Lumia 800 held its ground thanks, probably, to very aggressive pricing in many markets. Obviously this had an effect on the global share of Windows Phone 8 compared to Windows Phone 7. Last month WP8 accounted for a little over 5% of Windows Phone devices and this month it jumped to 19%. A very substantial achievement. The world is very diverse and we decided to look at some localized stats this time. United States is one of the biggest markets and definitely the one dictating smartphone “fashion”. With that in mind it’s very interesting to see how different the market is from the rest of the world. As you can see even with limited availability Nokia Lumia 920 managed to grab the top spot in US. It’s worth reminding that we measure usage, not sales, and that means that there are more Lumia 920 devices in use in United States than any other Windows Phone. That’s a very notable achievement for a device that is only available on one operator and constantly suffered from supply shortages. HTC 8X got 11% which made it the fourth most popular device. Both Lumia 920 and 8X contributed to a very impressive growth of Windows Phone 8 share in US market. Windows Phone 8 is approaching half of the Windows Phone market share in the US (currently at 43%) and since none of the older devices got the update this means all of these gains are coming from the new phone sales. As for carrier spread, it’s no surprise that over half of the market is controlled by AT&T (51%), followed by T-Mobile (27%) and Verizon (16%). And finally let’s take a look at the numbers for Windows Phone 8 devices on the AT&T network. 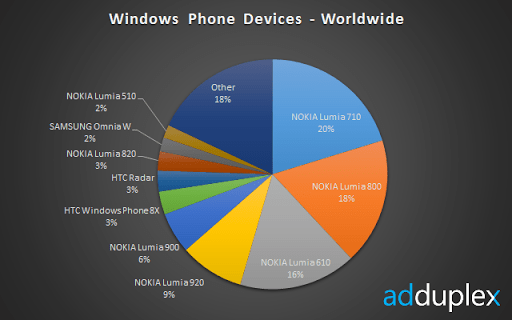 Not surprisingly Nokia Lumia 920 dominates there with 71% share. HTC 8X is way less popular on AT&T, but is available on all 3 major carriers. 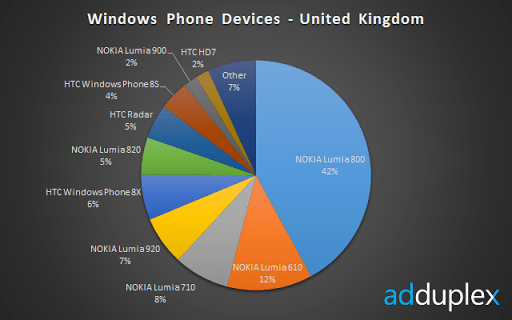 As you can see the situation is completely different in UK where Lumia 800 reigns supreme followed by 2 other cheaper Nokia models. Lumia 920 and HTC 8X occupy 4th and 5th position respectively. 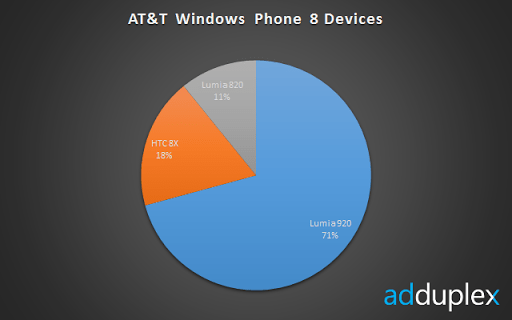 2 other lower-end Windows Phone 8 devices made it to top 10 too, with Lumia 820 and HTC 8S commanding 5% and 4%. We’ve seen reports of impressive Windows Phone market share growth in southern Europe and especially in Italy. So let’s take a look at which devices are most popular there. The situation is very different again. 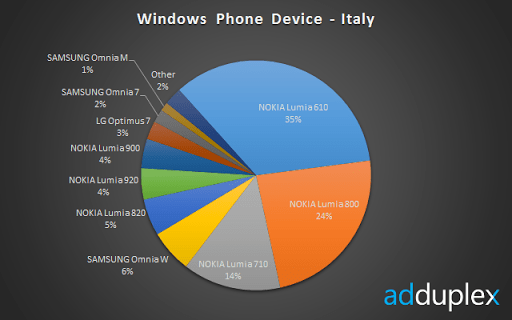 Nokia Lumia 610 is the most popular Windows Phone in Italy by far. Even when it comes to Windows Phone 8 the lower end Lumia 820 (5%) outperforms the much hyped 920 (4%). This could be due to the fact that Lumia 920 is a very hard to find phone or it just follows the trend of lower end phones performing much better in Italy. Another big growth market for Windows Phone is Russia. 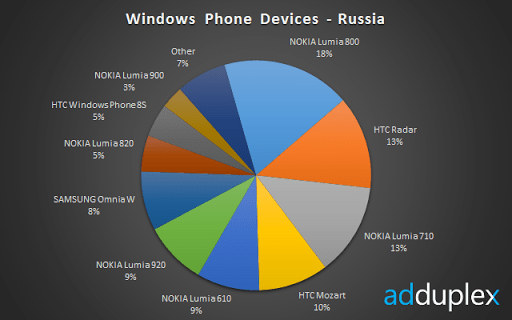 The spread is way more diversified in Russia with Nokia Lumia 800 having a small lead with 18%. 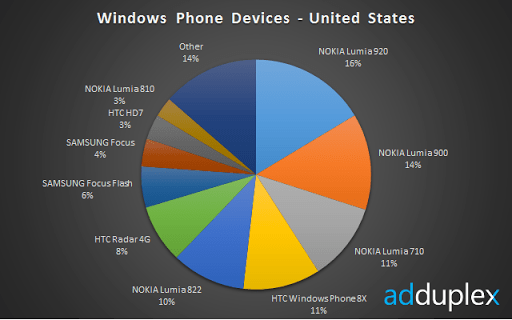 Lumia 920 comes sixth with a healthy 9% share. Lumia 820 and HTC 8S got 5% each. 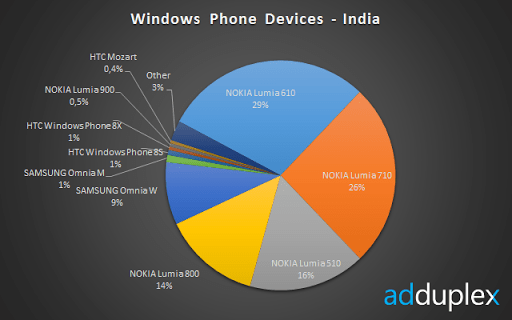 Lower end Nokias dominate in India. HTC 8X and 8S have joined the top 10 though, with WP8 Nokia devices showing only episodically. Lithuania is too small to produce any statistically meaningful data over one day, but we couldn’t resist including our home country in the report. So here goes. Lumia 800 is massively dominant which aligns perfectly with the fact that it’s the most promoted Windows Phone over here and is included in all the special offerings on all 3 major operators. That’s it for this report. Next month we will try to look at other markets and possibly other metrics.